Set in the Highlands of Scotland in the tenth century, with a female protagonist, 'Brave' is, in many ways, one of Pixar's most pioneering films. In other respects, it is one of the most derivative and unimaginative. The result is inevitably mixed yet as with any Pixar animated feature, there is plenty of charm and sentiment to be enjoyed in 'Brave'. The film opens with King Fergus of the Clan Dun Broch giving his daughter, Princess Merida, a bow for her birthday, to the disapproval of her mother, Queen Elinor. A demon bear soon attacks the family, fought off by the King. Years later, a teenage Merida yearns for normality as royal duties are enforced on her - most notably, as she finds herself about to be betrothed to a member of another clan to protect the unity of their kingdom. Merida defies her parents' wishes and the kingdom's traditions, falling out with Queen Elinor as a result. Merida is led to an elderly witch, who she asks to help change her mother. Unsurprisingly, this doesn't quite work out in the way Merida intended and she finds herself on an adventurous path to undo the spell to save her family and the kingdom from peril. 'Brave' is Pixar's first fairytale - an undoubted influence from their relatively new partnership with Disney. There are similarities to recent animations 'Tangled' and 'How To Train Your Dragon', although both films are superior to this one. This is perhaps unsurprising considering the troubled production of 'Brave', which saw their first ever female director, Brenda Chapman, thrown off the project for "creative differences". Chapman does receive a director credit, along with her replacement, Mark Andrews - who has the ignominy of being co-writer of 'John Carter' but has worked on the likes of 'The Iron Giant', 'The Incredibles' and 'Ratatouille'. Unfortunately, Andrews fails to capture much of the magic of his previous work here and perhaps Chapman's continued involvement would have been an advantage. There are times when 'Brave' truly captivates, typically in the humour of the young trio of twins who are a joy to watch each time they appear. They alone will enrapture any children watching. 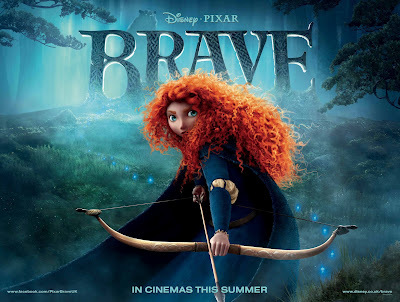 For adults however, the family values aspect of the film may begin to feel laboured and while the enchanting country-folk soundtrack and remarkable animation raise spirits, 'Brave' fails to reach the usual lofty standards of a Pixar film. 'Brave' is out in UK cinemas now through Disney-Pixar.